It’s never too early to start thinking about your upcoming VBS program! When is the best time to start planning? How often should you check in with your team along the way? Read this post and download our free VBS Planning Calendar to get a jump start on this year’s program. Choosing a date should be the first step as you get ready for VBS 2018. With your date in place, work backward to determine when to start on individual tasks and to-dos. Many churches hold their VBS around the same time every year, whether that’s the week after school gets out, the third week of June, or two weeks before the start of school. Whatever the case, if you already know your date, be sure to get it on your church calendar and get the word out as soon as possible. This gives families the information they need as they determine their spring and summer schedules. Church staff availability. It is vital that your Pastor and staff have visibility with children and parents and opportunities to develop connections with newcomers. 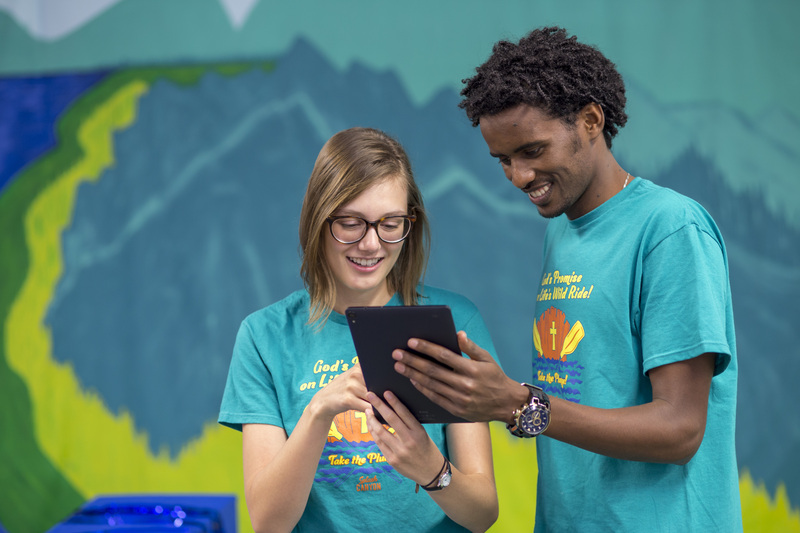 Ask staff members to lead worship or music, lead or help with a site, or greet families as VBS begins and ends. School schedule. Some school districts offer summer school. Avoid scheduling during your district’s summer school. If your community has year-round schools, offer VBS during one or more of the breaks. Community conflicts. Consider scheduled community events such as swimming lessons, sports camps, and scout camps. Call other congregations to avoid scheduling VBS at the same time. New program invitations. Schedule VBS about a month before fall programs kick off so you can promote those programs in follow-up phone calls and visits. Work and child-care needs. To get more children to attend, consider an all-day program or free transportation. Make sure you have nursery care available for volunteers. Alternatives. Provide an evening program with a meal to allow families to attend together. Other alternatives might include a one-day, all-day VBS or one day or evening each week for five weeks. Make sure to consider how different schedules might affect attendance. Check the Director CD for more information about these different formats. Check yourself. Choose options that best meet your goals and intentions for VBS. Excerpt taken from Super Duper Director Guide, p. 20. © 2018 Concordia Publishing House. With your date set, the next step is identifying your core planning team members. Your core planning team will be responsible for the big-picture tasks for VBS 2018: goal setting, volunteer and student recruitment, and schedule coordination. Consider writing up a short VBS planning team job description that describes your ideal planning team member. Then, get the word out—post the job description in your bulletin, email newsletter, and website. Ask your Pastor if you can announce the planning committee details before church or Bible study. Build excitement for the committee by showing a quick video slideshow of last year’s program, or ask one of your students from last year to share his or her experience with the congregation. Find those “big-picture” thinkers in your congregation. Balance seasoned volunteers with new faces. Identify key personality traits and skill sets for your planning team. With your date and your core planning team in place, the next step is to set up your planning calendar. The downloadable calendar at the end of this post is a great starting point. Just fill in your start date and it will automatically suggest when you need to complete each activity and task! Don’t be afraid to modify and adapt the tasks for your church’s unique needs. Once you’re happy with the dates, make them easily accessible for your core planning team. Create a closed group on your website with the planning calendar, or make a Facebook group just for your planning team. Make sure that team members have both a hard copy and electronic access to your calendar so that everyone is on the same page. Consider managing tasks in an online spreadsheet or app like Asana or Todoist so that everyone can stay on track with the schedule and communicate easily. Ready to get started? Our free VBS planning kit includes a customizable planning calendar and goals worksheet to assist you!